I love beans. Love, love, love! I could eat beans at every meal (which ironically is suggested in the paean to legumes that every kid knows and which some in my house sing to me frequently). So, I’m sort of jaded when it comes to this recipe when I say that you will love it! Nobody has not liked it (yep, that double-negative was intentional). 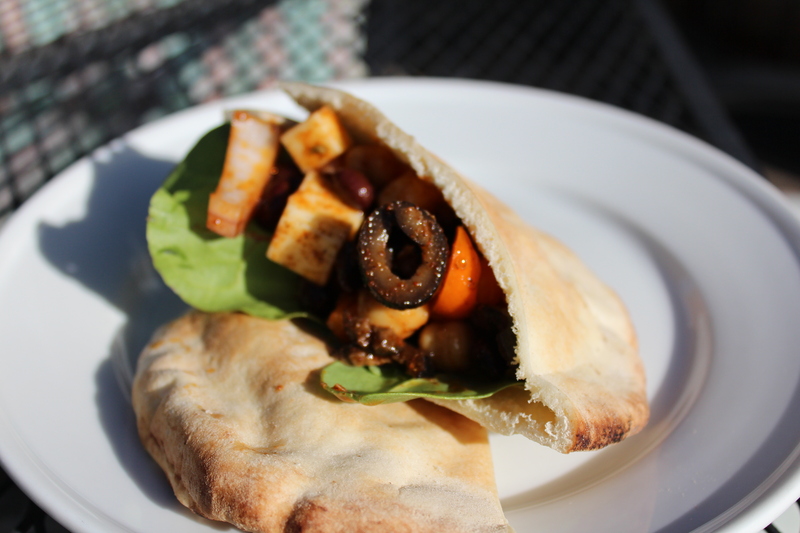 This is a combination of flavorful legumes, crisp vegetables, a slightly biting Monterey Jack and briny olives all tucked into a pita pocket with just a hint of Mexican spice. Or, for the gluten-free among us, you can make a proper good Boston Bibb lettuce wrap that won’t leave you feeling like you’re missing out. Around these parts, the wee locusts eat it with a spoon, leaving plenty of pita for dipping in hummus. Keeping count of the bean quotient here?! It’s really the only way to go. This recipe is a family favorite. It came from Aunt Dee and the first time I remember having it was for an Easter picnic in Thurmont, MD, when I was maybe 13 or 14. Aunt Dee is married to my maternal aunt’s (Dot) husband’s (Frank) identical twin brother (John). If you could follow that, you’d see that she’s technically not my aunt. Not one to stand on technicalities, she’s one of my favorite aunties. She’s always got a smile, a kind word, and is genuinely happy to see me. That sort of person is in short supply so I treasure the ones that I have. I used to babysit their girls on occasion. One New Year’s Eve I came to watch Ginny and Lynn and Aunt Dee made us a fondue dinner before they went out for the evening. Lordy that was delicious and elegant; I felt so grown up and fancy… I love to make fondue on special occasions; brings back great memories. Oddly, Aunt Dee also reminds me of hot dogs. One summer many years ago, we were at Aunt Dee and Uncle John’s new (at the time) house marveling at the speed with which the new-fangled microwave oven could cook a hot dog. We would put the dogs in buns, wrap them in a napkin and zap them. Not sure we ever apologized for the number of dogs we plowed through but it was just so damn fascinating. My life. You getting a clearer picture now? Anyway, I’ve tweaked the original recipe to suit my legume love and include more beans. I use colored peppers instead of green (one of the few vegetables that I do not like raw) and more onion than called for. The recipe is pretty adaptable. If, say, you find yourself short on one variety of bean, add more of another. Pepper bigger or smaller than called for? Throw it in. It’s great for quick tasty meals. I’m pretty sure Monica keeps it in regular rotation at her house, too. Kids love the stuff. It’s vegetarian-friendly without seeming like an afterthought. It’s not, however, vegan, nor (heed this warning!) does tofu make an acceptable substitute for Monterey Jack. One last quick note. This recipe calls for taco seasoning. I make my own because I find the commercial sorts too salty. If you’d prefer the packaged variety, just taste for saltiness before you dump in the whole amount that I call for. Go forth and be good to your heart! 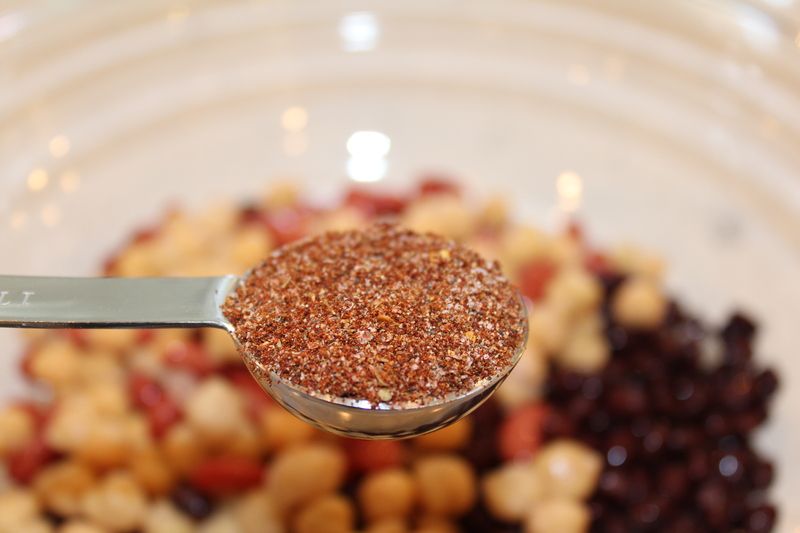 Making taco seasoning mix is only difficult if you don’t have the ingredients. If you don’t have the ingredients, you probably don’t have taco seasoning either. So, since you’re heading to the grocery store, you might as well pick up the stuff to make your own. You truly won’t be disappointed and you’ll wonder how you lived without this knowledge for so long. 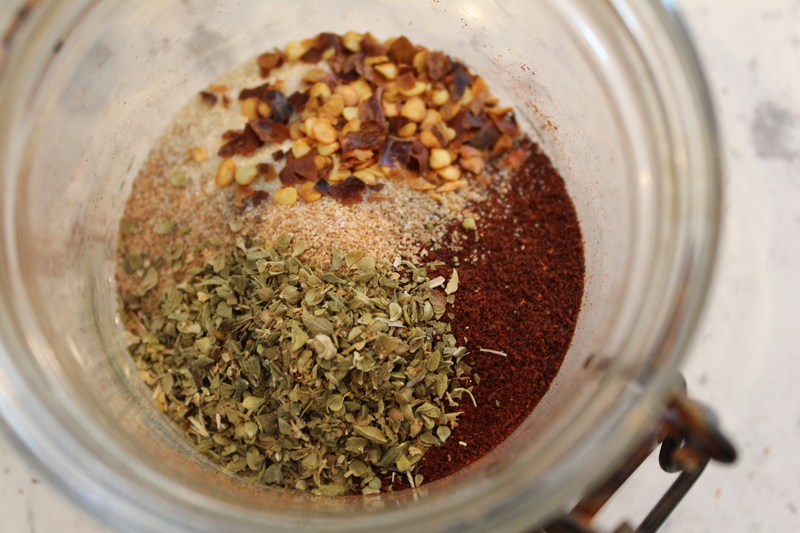 Taco seasoning: Measure ingredients into a tightly-lidded jar and shake. A whole-body quake to a rousing chorus of “We are the Champions” will do it. Beans. MUST. Be. Rinsed. Otherwise, they have an unpleasant sliminess that will not go away. Some folks swear that rinsing will also negate the flatulant effect. No idea how you’d do the research on that one but sure, we’ll go with that if it sounds good. Just rinse them. Oil, vinegar …. oh, the anticipation is building! Add the taco seasoning to taste (I start with 2 tablespoons). 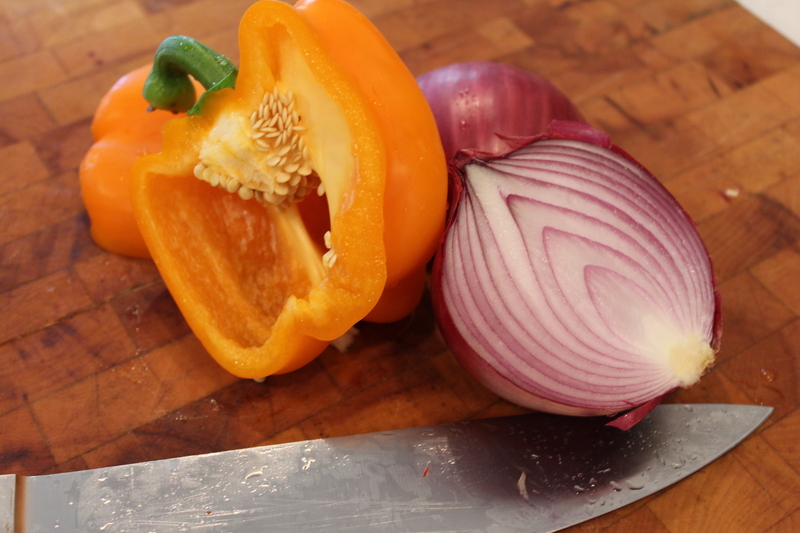 Chop your pepper and onion. I tend to make mine chunky but you can mince or julienne as you want. This is an utterly adaptable recipe. Ta da! Done. Taste for seasoning. It will be a bit sharp until it gets a chance to mellow in the fridge. If you’ve started conservatively (2 tbs) you may need to add a tad more taco seasoning now. Do not add taco seasoning just before serving. Dried herbs/spices need time to make nicey-nice with a dish and will overwhelm if not given that time. The dish should really be covered and refrigerated for a few hours (or even a day ahead) to get the full flavor developed. Serve in a pita pocket, rolled in a Boston Bibb lettuce leaf, or just eat with a spoon. This will last, covered in the fridge, two days. Beyond that is a mystery since I’ve never gone past 48 hours without finishing it off. Pita pockets halved and/or Boston Bibb lettuce leaves for serving. Rinse the beans thoroughly and drain. Put into a large bowl. 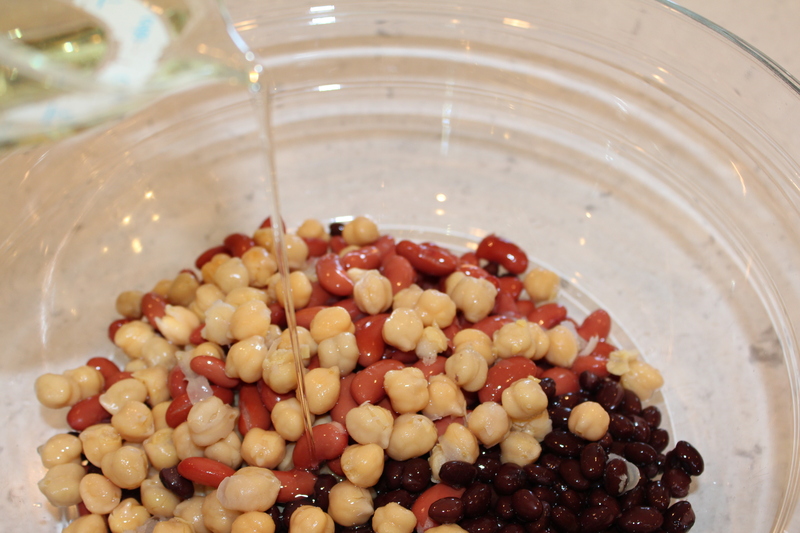 Drain the black olives, slice, and add to the bowl with the beans. Alternatively, you can buy a can of sliced black olives. Drain and carry on. Dice or julienne the pepper and onion. I cut mine to a 1/2 inch(ish) dice. Add to the bowl. 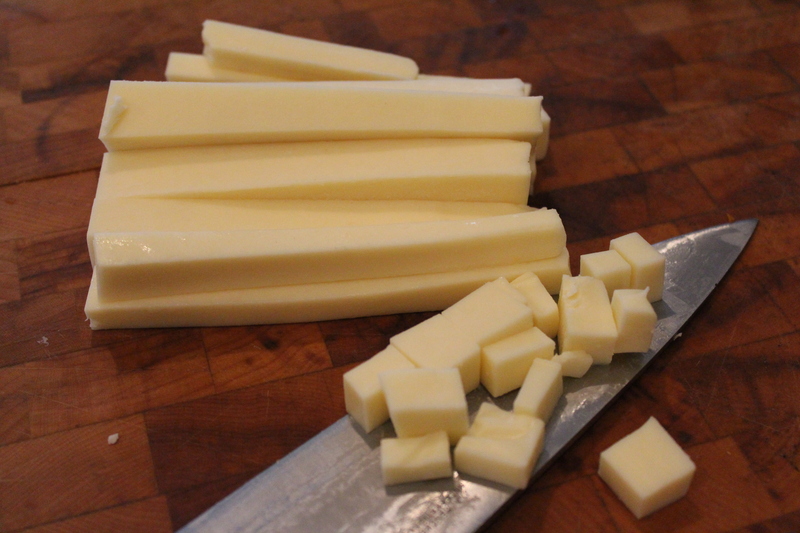 Cut the cheese to a 1/2 inch(ish) cube. Add to the bowl. Add the oil, vinegar, sugar, and 2 tbs taco seasoning. Toss thoroughly yet gently and taste for seasoning. It will be a bit sharp/acetic at this point. You may (and I generally do) need to add more taco seasoning. Toss again, cover with plastic wrap, and refrigerate for a few hours or overnight. Stir gently before serving. This entry was posted in Beans, Main Dish, Salads, Sandwich, Side Dish, Vetegarian and tagged Barbecue, beans, Cheese, cookout, favorite dish, feeds a crowd, gluten-free, kid friendly, Lenten meal, Make-Ahead, meat-free, onions, peppers, Picnic, pita, salad, Sandwich, tradition, vegetarian. Bookmark the permalink.